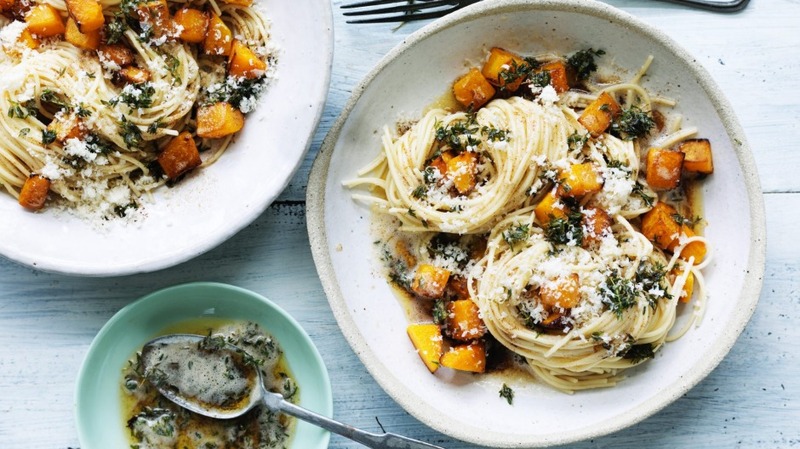 Try a rich pumpkin pasta like this one and we promise you won't miss the meat. Bring a large saucepan of salted water to the boil. Cook the spaghetti according to the packet instructions until al dente. Take care not to throw away the pasta water. Emulsifying this water with the brown butter is the most important step. Heat the olive oil in a large, deep frying pan over a medium-high heat. Cook the pumpkin for 4-5 minutes until caramelised and tender, tossing frequently. Season with salt and pepper, then remove pumpkin and set aside. Reduce the heat to medium and add the butter to the pan. Swirl around the pan until the butter starts to turn a deep golden brown and give off a nutty aroma. Add the thyme leaves, then turn off the heat. When the pasta is cooked, return the frying pan of brown butter to a low heat. Strain the pasta, reserving an espresso cup of the pasta water (about 75ml), then add the pasta and reserved water to the pan. Toss well to thoroughly combine the butter with the pasta water. Return the pumpkin to the pan and toss through half the pecorino until combined. Divide the pasta among 4 bowls, scatter the remaining pecorino over the top and serve.